See-Dub: Who won the Fiesta Bowl? We were fresh out of buckeyes to use for this game's TEXAS Foodspell, but since those nuts are inedible, I don't think we can count them as food anyway. As Darrell K Royal once said, "Ol' ugly is better than ol' nothin'." Our worst performance all year, this game wasn't pretty. Thank goodness for Colt McCoy! That last drive was a thing of beauty, as was Colt's spin-around rushing TD earlier in the game. And how's this for a great headline? 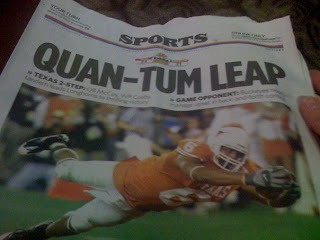 What a way for Quan Cosby to end his career at Texas. Texas 24, Ohio State 21. Fifth straight bowl win for the Horns.